My fishing has been pretty grim lately. I was beginning to think that there was some sort of curse on me (I'm not superstitious - honestly). Anyway, a few days back my pal Bill had caught several bass on one of his Sluggill lures. The day after he and I went back to the same place at the same time/state of tide - NOTHING! Of course that's fishing so we weren't really surprised even though it was a bit disappointing. 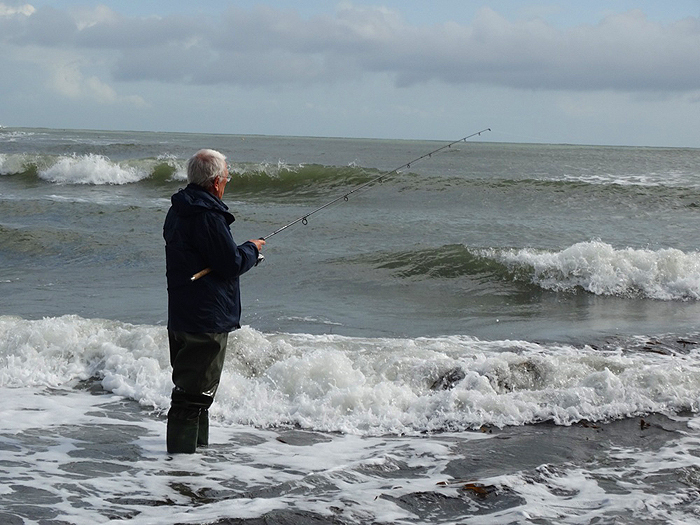 It had been pretty rough and the sea was filthy when we made our trip so two days later, when the wind had dropped and the sea had calmed down I decided to try the same spot on the equivalent morning tide (we'd fished in the afternoon). I stumbled along the beach in the dark andspent a good half-hour flogging away with my biggest Slandra. I fanned the casts out and covered every inch of water as it got light. The sea was still very murky but much calmer than on our previous session. Anyway, once more I didn't have a sniff. I decided to have a few casts as I wandered back to the car. The first spot I tried was a shallow, rocky gully carpeted with wrack. In years gone by I have caught fish from that spot but it was just filling with water and there was a fair bit of colour so I wasn't very hopeful. I flicked the Slandra out and slowly inched it back just under the surface. Bump! Was that a rock? 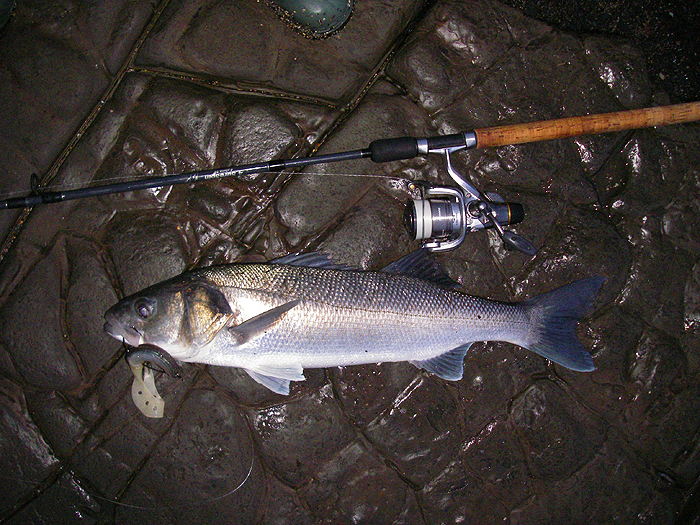 The clutch screamed and the water boiled as a good fish grabbed the lure almost in the edge of the sea. I was glad of the long rod as I steered the line between the boulders in the shallow water. Eventually I was able to slide it over the rocks and jump down into the gully to pick it up. Success at last! 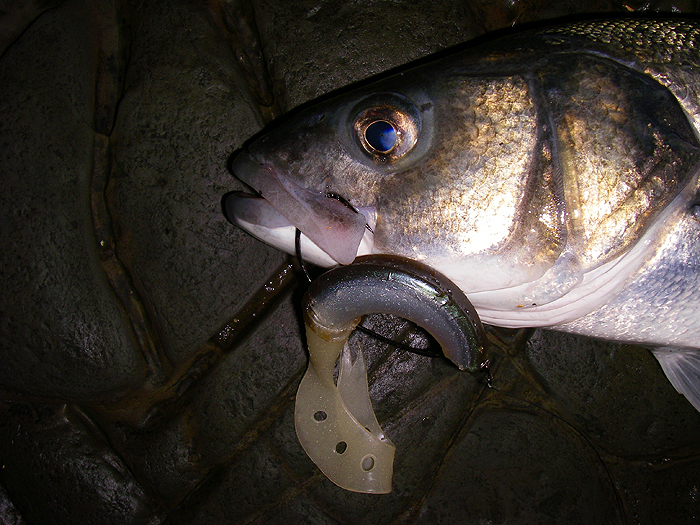 I took a couple of pictures before removing the size 6/0 Hooking Master hook and slipping the fish back into the water. The bass flicked its tail and shot out to sea. Fantastic!